There’s no added yellow color, which isn’t really important. For a sharp cheddar, this has a rather weak taste. Physically this is also rather soft for a sharp cheddar. There’s a peppery-like sharpness after a few seconds on the tongue. 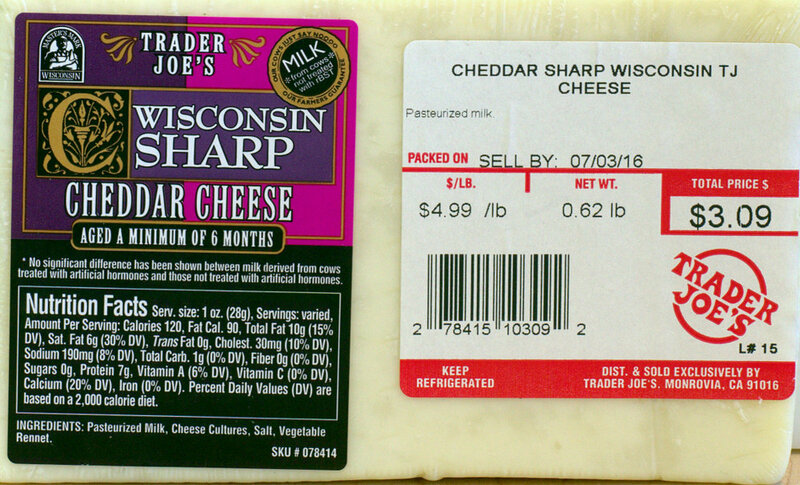 This is not what I expect from a sharp cheddar. On the plus side, the price at $4.99 per pound is rather reasonable. Calories clock in at 120 per ounce. This entry was posted on 07/17/2016 at 22:26 and is filed under food, Recipes, food, cooking and related items, Trader Joe's. You can follow any responses to this entry through the RSS 2.0 feed. You can leave a response, or trackback from your own site.